The Master of the Mystic Arts has arrived in the 21st Century, just in time to save the world from its dark forces. When my daughter, Emily, gleefully informed me that a Dr. Strange movie was finally going to be made, starring the “it” boy of our age, Benedict Cumberbatch, my magical mind did a little dance. How I had longed for this day. And by the hoary hosts of Hoggoth, lo it hath arrived! Or, rather, will arrive, late in 2016, according to recent reports. Why Dr. Strange? One word: mystery. A former venal surgeon turned enemy of ephemeral bad guys, Stephen Strange tapped into my imagination by entering into dimensions full of wonder and mystery. The weird netherworlds depicted by series creator Steve Ditko, and later by writer Roy Thomas and artists like Dan Adkins and Gene Colan, enthralled me. For a kid who was deep into the psychedelic-era Beatles, “The Lord of the Rings” and Mervyn Peake’s Gormenghast Trilogy, Strange’s battles with the likes of Nightmare and Dormammu was heady stuff in every sense. I started reading Dr. Strange in high school and continued, I am now embarrassed to admit, well into college (although comic historian Mike Benton has written many a collegian consumed it with “the belief of a recent Hare Krishna convert”). So captivated was I that I wrote a letter to Marvel just to let them know. To my delighted astonishment, they printed it in issue No. 173, October 1968. I have kept the comic (along with a couple dozen others) in a box dutifully marked “Dr. Strange.” The letter takes up most of one column, as I prattle on about the profound genius of a comic book: “It is unsurpassed by ANY publication in its manner of opening your mind to new, mysterious and wonderfully haunting worlds.” Prude that I was, I also chastise the writers for having Strange smoke a cigarette, and helpfully advise against having him battle mere super-villains – only otherworldly foes, please! Further embarrassment: I sign my letter “The Gifted One,” a title I had assigned myself while strong under the spell of Tolkien’s Gandalf. Likewise, my soulmate Brad, with whom I regularly exchanged fanciful letters at the time, was “The Enlightened One.” Like many good children of the Sixties, we were deep into our own thing. I suppose it is not a great stretch for a teenage wizard fascinated by the Sorcerer Supreme to end up as a religion writer for a Midwest newspaper. We were dealing in the spiritual and supernatural, after all. Brad ended up owning a highly successful, energy-efficient streetcar company. Go figureth. As it turned out there were other wizards in the land. Following publication of my letter I heard from a few, including one with literary powers from Bradford, Pa. She is a well-respected anthropologist today. Strange the paths we all have taken since those heady days. Imagination lights the way on many wonderful journeys. I have no doubt that when Cumberbatch meets Strange, many more young imaginations will be set afire. Verily, by the flames of Faltine, the outcome will be most passing strange. Yeessss. 🙂 So excited! 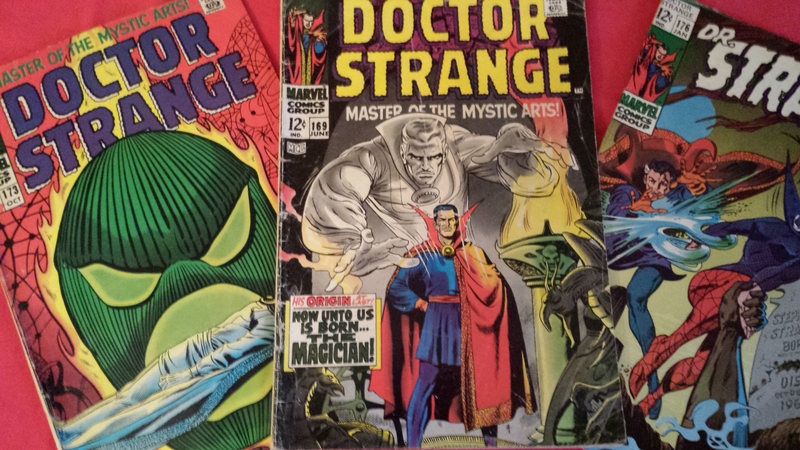 I may raid your box of Strange comics while I’m home, Dad. I remember reading them at the cabin and being delighted, but it’s been a long time. I will keep them out just for you dear. 🙂 You can read them before we go to see The Imitation Game!